Lately I’ve been finding myself using my iPhone more and more for lessons. Well, to be accurate, I’ve been using my iPhone and my students’ iPhone, iPad or iPod Touch. It’s incredible how popular these devices have become. Nowadays, almost everyone has a smartphone. In fact, it’s become harder and harder to find a good cellphone that’s just a phone. And if someone doesn’t have a smartphone, they probably have a tablet like an iPad or an iPod Touch. In fact, every one of my student (regardless of age), has one.. or two.. of these. And I’m finding them more and more helpful for helping them learn. The teaching method I’ve been using, which I believe many teachers are using now, is to allow the student to choose the songs they want to learn. Of course, as the teacher, I analyze the song and determine if it’s helpful toward the student’s learning in terms of difficulty. Maybe there’s no new skill to be learned. Or maybe the skill level jump might be too overwhelming. More often than not, the songs are new to me too. So I have to learn them and I do the majority of my learning while driving. For a while, I was buying songs on iTunes which worked out okay. But I discovered that many of the songs I teach are not necessarily what I’d listen to for my own entertainment. So I decided to give Spotify a try. If you’re not familiar with Spotify, it’s a streaming service. The desktop version is free and will allow you to build your own playlists from their catalog of songs. But to stream your playlist on your mobile device, you have to subscribe to their service. This has been working very well for me. Sometimes a student might suggest a song and I can search for it on the spot and listen to some of it with them. The other handy tool that I’m starting to use more and more is voice memo on the iPhone/iPod. I’m sure other smartphones and tablets have something similar. Anyone who’s learned an instrument knows that a lot of times you have to slow something down in the beginning to learn it. Or if you’re trying to learn a specific part of a song (i.e. a riff/lick), it’s helpful to isolate just that part and instrument. So when it looks like a student need a little more help with a little section of a song, we’ll open voice memo on their iPhone/iPod and I’ll record something they can practice with by themselves. It’s like I’m there without being there. Of course, this is not unlike following an instruction book that might come with a CD. Often, each exercise in the book (commonly referred to as “figures”) will be on the CD that you can listen and play along with. The great thing about being able to use something like voice memo is that I’m able to customize the exercises to the student’s need at that time starting with the particular part for the particular song. The student might even be able to find the exact same lesson on youtube (there are so many guitar lessons on youtube!) but not necessarily by a teacher who’ll explain it the way they need to hear it or broken down in a way they can tackle it. With voice memo, I’ve been able to provide progressive exercises. Sometimes, each exercise might be as short as half a measure. At then, of course, the final exercise will be the whole riff/lick/etc. And not to mention other helpful tools that you can find in the app store like guitar tuners and metronomes. It’s amazing how technology changes the way we do things. I couldn’t have imagined doing these sort of things 10 years ago. I haven’t tried using Skype for lessons yet which I know many teachers are using now. I’m looking forward to giving that a try. If you’re new to an instrument, whether it’s the guitar or something else, don’t beat yourself up because it doesn’t seem like you’re getting it quick enough. We all learn in our own way and at our own rate. Don’t get discouraged because it’s not sounding the way you expect it to the first day.. or the second day.. or even after a week. And don’t give up. Sometimes, you might know in your mind how it should sound or what you’d like it to sound like but it takes your fingers/hands/body some time to catch up. When it comes to technique, I don’t believe there’s “right” or wrong” or “good” or “bad”. Although, there is “clean” and “sloppy”. (But then again, maybe sloppy is what you’re going for.) In any case, the point is that everyone’s fingers work differently. What’s important is if the technique is serving you. Does it produce the sound you want? Does it allow you to play at the speed you want? Does it create the feel you want? And, probably most important, does it hurt? On the other hand, analyzing the details and figuring out what exactly is keeping you from being able to play a certain part or lick is a great practice to have. I think every great musician has to do this one time or another. And once you find that little piece that’s giving you a hard time, just practice that short passage until you get it and then add it to the rest. Or maybe there are a few parts that are difficult. Practice them individually then string them together. But whatever you do, don’t beat yourself up over it. It’s not worth it. So I had this new-to-me pedalboard case for… wow, it must have been 6-7 months… that I didn’t do anything with. Since I haven’t been playing a lot of gigs on electric I guess I didn’t have a reason. But this week I decided it was time. But the great thing is that I was able to leave space for expansion. The lower left-hand corner is spaced so I can drop in the Digitech Jamman (1st Gen). The Korg DT-4 tuner, which is great in terms of tracking and accuracy, didn’t make it to the new board. That has been my tuner for 17 years..?? But it was never a great stage tuner. So I’m going to give the Boss TU-2 a try. 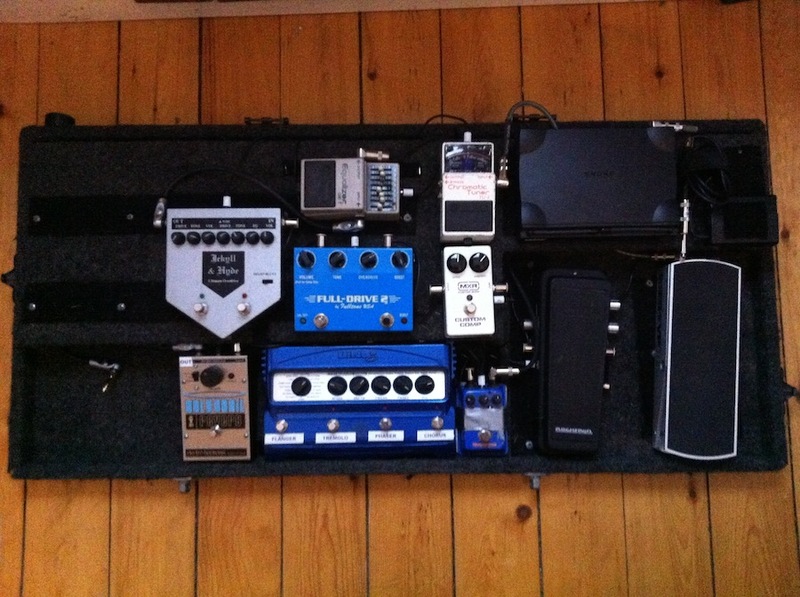 I’ll probably make another board for the acoustic setup and put the Korg there. The Ernieball Pan Volume pedal also didn’t make it. Unfortunately, it’s too long to fit on this board. Good thing I have the Ernieball VP Jr. (which needed to be fixed first but that’s another story). And I was able to add the MXR Custom Comp which I bought fairly recently. I’m adding it to the signal chain in front of all the drive/distortion pedals after the wah (guitar > volume > wah). We’ll see how it goes. I’m kind of using it as a fattener and I think it does the job fairly nicely. The other thing is that the Brian Moore i8 has coil-tap but the tapped signal is always so much weaker that I couldn’t use it. Now I can switch it over to the tapped sound and boost it up a little with the compressor. I’m sure this isn’t the way it’s meant to be used. But with everything I have, this sounded the best to my ears. I had some problems with the George L cables at some point. But I checked all of them with a cable tester and they were fine. I adjust a few just to be safe. So I got some of those and some Planet Waves DIY cables in there. With the old board, I did my best to fit everything and at the same time make sure I can push all the buttons with my foot without accidentally hitting a knob. With the new board I’m able to position almost all the pedal the way they were designed to be used (except the Boss GE-7 which I put sideways because it was easier to hook up the cables and that pedal pretty much just stays on anyway). The new board has a raised platform for the upper row so all the cables can be hidden away. So much cleaner! 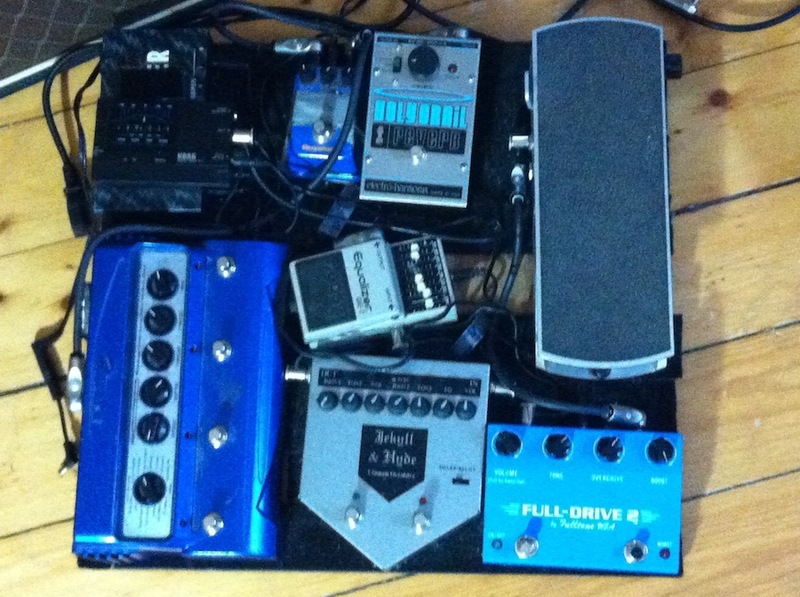 I’m thinking of adding another drive/distortion pedal on the upper right-hand corner where I have more space. Or maybe a power strip? As it stands, I have 4 power chords coming out: 2 Visual Sound One Spot (Line 6 ML-4, EHX Holy Grail), a power chord for the Voodoo Lab Pedal Power 2 and an adapter for the Shure UT-4. It would be great to be able to plug all of them into a power strip and just have 1 coming out of the board. But we’ll see. I’m looking forward to trying this out at upcoming gigs this summer. I’m not sure how this happened exactly. But except for the volume pedal, somehow I managed to group all the pedals together by color. And much like my wardrobe, everything is black, white, blue or grey. Go figure. When I first started playing guitar, I was really into 80s metal. I never saw any of my heroes using capos. You know, it was all rock with heavy distortion. A lot of power chords and open string stuff. For a long time I thought using a capo was cheesy. Only for people who didn’t know how to use barre chords. And something that I didn’t like about it was that notes held by the capo didn’t sound the same as notes from open strings. They sound muted. And because I was playing a lot of rock, I wanted all the notes to ring as loud and as long as possible (even on acoustic). But later on I realized that if you wanted a certain sound that’s produced by a specific way of holding a chord, let’s say for instance the G (major) using the C-shape down around the 8th fret (open G-string), but you need it in a certain key (let’s say you need this for Bb), then using a capo is really the only way to accomplish this. In my original project, Simple Souls, some of the material is meant to sound folky. 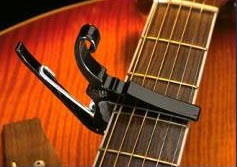 And I noticed that a lot of folk singers use capos. Most often, they would use a capo and then play open (string) chords. The aha moment for me was when I realized not only does that allow them to get a certain sound and sing at a comfortable key. But the muted sound the capo produced was also part of the feel. So now I embrace the capo. I also like using it in acoustic jams so that I can play chords in a different position from someone else and thicken the sound. At the same time I can use mostly open chords and not tire out my hand. One of my students wants to learn about songwriting. So I’ll be showing him how to use the capo to change keys quickly. I’ve used a number of capos. Right now, my favorite is the one in the picture above. A few brands make that style capo. I’m using the one made by Keyser. Do you use a capo? When and how do you use it? Leave a comment! I’ve been teaching one of my students how to play the Star-Spangled Banner. This student is really into it. It was his suggestion actually. I’m hoping to be able to use this song to show him a variety of playing techniques: slide, hammer-on, pull-offs, bends, 3-note per string runs, etc. I’m pretty psyched about it. Kids are just amazing! I’ve been teaching guitar to a few young kids who are about 10 or 11. And even though in some cases their hands aren’t quite big enough to hold the chords, they try so hard and they’re just completely fearless! Week after week I’m surprised at how quickly they learn the previous week’s lesson. Today kids have access to everything and they have such diverse interests in music. In one lesson I might be teaching 90s pop then the next lesson might be 70s and 80s rock then it might be a Beatles tune after that. In some way, I think it might be easier to teach kids than adults. Even for basic music theory! Got this amp used on Craigslist for a pretty good price (I think). Tried it out for a couple of minutes the other day just to make sure everything works. It seems to have a lot of sounds in it. It’s a very, very light amp — perfect to carry around. Tonight will be the big test — going to try using it to give a lesson. We’re working on Back in Black (AC/DC). So I’ll be trying to dialing in some classic, Marshall stack like distortion with some nice overtones. It’s got to sound decent with power chords, full chords, and blues licks. So we’ll see. Sure beats lugging around an amp and a huge pedal board. Okay. Quick note. Just got this great little amp. Used it live for the first time 2 weeks ago. Everything sounded great through it. All my pedals, guitars, etc. I just love it when it’s like plug-n-play. The output level is just perfect! The only thing is I still like the Holy Grail for reverb better. I really haven’t found a built-in reverb I like so I guess I’m not surprised. Anyway, now I’m really looking forward to playing with this thing and the Blade tele. There’s so much depth and warmth and chime! More lessons coming soon… I hope!